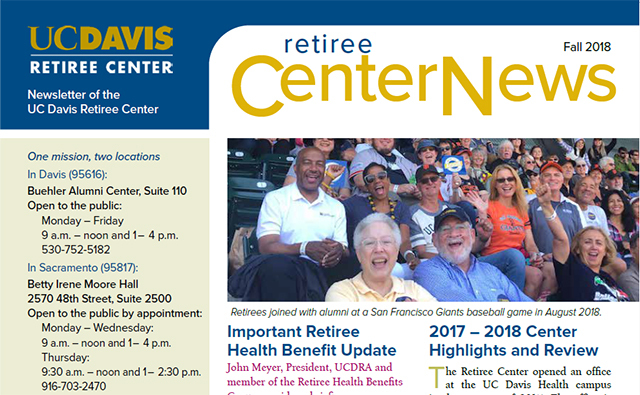 The UC Davis Retiree Center News & Events is a bi-weekly email update with information which may affect retiree health and welfare benefits or pension, updates on campus and community events and other news of interest to retirees. You may view the current issue by clicking on the masthead above.You may view past issues in our news archives. 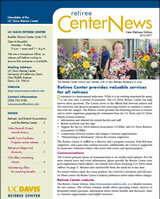 For UC Davis retirees who do not wish to receive weekly email updates but still want an annual update from the Retiree Center, the UC Davis Retiree CenterNews is published and distributed to via U.S. mail once per year. The newsletter will include the calendar of activities for the coming year, information about Open Enrollment presentations and other news of interest to retirees. Get a brief overview of UC Davis retiree benefits and privileges, volunteer opportunities, and the most frequently address questions. View on-screen (landscape); or Print version (8½ x 11"). Open Enrollment flyer for retirees. To continue connections with colleagues and the campus, retirees are encouraged to join the UC Davis Retirees' Association or the UC Davis Emeriti Associations. The associations represent and advocate for all retirees and plan social and educational programs for their members. Members receive discounts on Retiree Center events and complimentary membership in the Osher Lifelong Learning Institute (OLLI). Past issues. Congratulations on your retirement. You ask, "What's this all about?" "I've heard that now that I am retired, I get free parking; how does that work?" The Retiree Center has compiled these frequently asked questions into the New Retiree's edition of our newsletter. Learn what services are availible through the Retiree Center, how you can stay connected, and what are the relationships between the Retiree Center and the UC Davis Retirees' Association and/or the UC Davis Emeriti Association. Learn where to find your retirement benefits income statement, how to get your retiree ID and much more. Print Version (8½ x 11) or screen friendly (landscape). We encourage you to continue to explore this website. Hours of operation change, locations change, and we are able to update the webpages with greater ease and flexibility than the printed version of this information. To view pdf files, you will need Adobe Reader , installed.